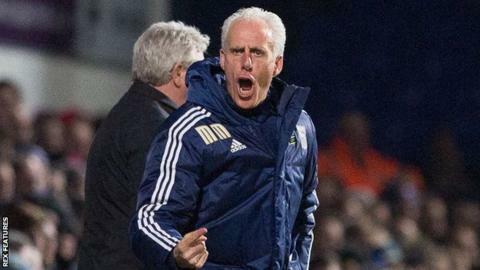 Ipswich Town manager Mick McCarthy admits his side's chances of making the play-offs are "slipping away". The Tractor Boys lost 1-0 at home to Championship leaders Hull on Tuesday, their third successive loss. Ipswich have now won just twice in 2016 and are six points adrift of the play-off places in 10th, having had a four-point buffer from seventh-place at the start of January. "Is it slipping away? Well quite obviously it is," he said. "If you get six points out of the play-offs and just lost three on the bounce, it is sliding away there's no doubt about it." Town now have a run of fixtures against teams in the mid to lower part of the Championship starting at Huddersfield on Saturday. "That slide can be halted and we can get back at it," McCarthy added to BBC Radio Suffolk. "It's not going to be easy as we've got Huddersfield away and that'll be no easy fixture, but we've got to start somewhere, so let's hope it starts Saturday."